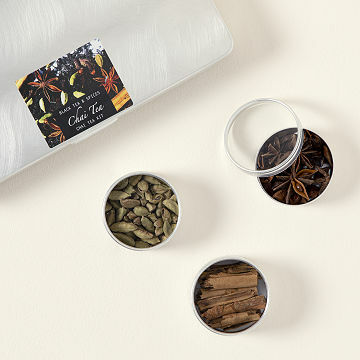 Experience an authentic taste of India with this aromatic chai tea set. In India, "chai wallahs" are tea vendors who set up shop along sidewalks and street corners. They take pride in their tea, often adding unique bits of spices to create a signature blend. Gathered from exotic markets, this beautiful collection of organic and fair-trade spices creates authentic chai flavor and a taste of India from your own home. Feel your body and spirit relax as you steep in the flavors of star anise, whole cardamom pods, whole cloves, Ceylon cinnamon, and Ceylon tea. A detailed recipe is included for novice chai brewers, or you can create your own signature mix. Simply mix and match to find your perfect combination, and you'll be on your way to discovering your inner chai wallah. Each pot of tea yields a serving for two. Assembled by Julie Pedersen in Montreal, Canada. Each kits yields approximately 12 pots of tea. Perfect for a Tea Queen! Tea is my friends life, and finding a good Chai can be difficult. Now she can make one to her exact specifications, changing the ratios of specific ingredients to get the perfect flavor. My son-in-law was delighted with the Chai tea kit, and was eager to use it. He had never seen anything like it. This is an awesome sampler for chai teas. Great gift! Last christmas my husband gave me this Chai Tea Kit yummy. Class act gift, will be enjoyed! This is a sure winner as a gift. Presentation is beautiful with classy containers. These are worth saving and using to pack supplements in traveling. My children know I'm a fan a chai tea. They gave me this set for my birthday. It makes a wonderful cup! I bought this gift for my 13yo niece as I know she loves Chai tea and noticed how much she liked making her own breakfast and lunch the last visit I had with her. It was a gamble but apparently it was a hit, she has loved experimenting and learning all the different flavors. The kit came quckly in plenty of time for Christmas. It is exactly as described and pictured. It looks fun! I have wrapped and delivered it and expect it to be well received. When I saw this item on your website I bought it without a second thought. My best friends wedding is coming up and I knew it would be the perfect gift for her bridal shower. The box came and it smelled AMAZING, I knew right off that the ingredients were great quality. My friend has now called me twice (the shower was last weekend) to tell me how amazing the tea is, and I'm going by this weekend to try it for myself. Great Product. I BUY THIS SEVERAL TIMES PER YEAR! I've given this Chai Tea Kit as a birthday gift, a Christmas gift, hostess gift, and I've also purchased it for myself after hearing how much my recipients loved it! It has several types of loose tea along with some fresh and fragrant spices like star anise, whole cloves, and cinnamon. The directions and suggestions are helpful. I usually simmer the spices in one saucepan and warm the milk in another. Sometimes I use a little honey or maple syrup to sweeten and other times a teaspoon of molasses fits the bill. But no matter how you make it, it's always absolutely delicious!